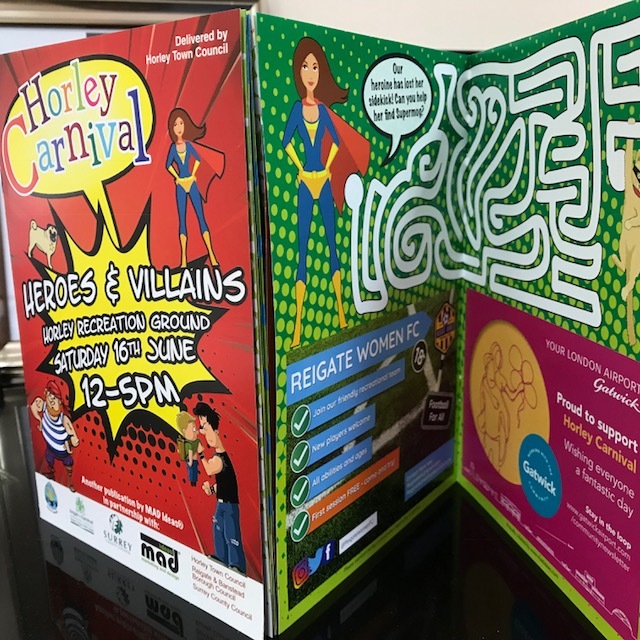 This is the fifth year we’ve created the much loved Horley Carnival programme in partnership with Horley Town Council, Reigate and Banstead Borough Council and Surrey County Council as part of our community initiatives. The colourful Carnival and brochure carries a different theme every year and engenders a strong sense of community. It’s packed full of information about the colourful parade which thousands of people take to the streets to see, plus puzzles and games for the whole family to enjoy! It takes an incredible amount of dedication by our team and every year the Carnival event and programme gets bigger and better. It is entirely self-funded and local schools and residents always love receiving their copies. Thank you to all the generous sponsors, London Gatwick airport, Susy Radio, advertisers and volunteers who make the event possible. Mike George, Chairman Carnival Committee.